So ABC television is shooting here in Lake Placid today. They are gathering footage for their "Good Morning America" show. I'm hoping to see Diane Sawyer since I am sitting here on Main Street in the real estate office. I didn't really want to leave the wood stove on this 8 degree morning, so it would be nice to see a celebrity to make it worthwhile. Or, I could sell a piece of property in Lake Placid. I do have a great property for sale on this famous street, Main Street, Lake Placid. Yes, the very street where national television crews hang out and shoot footage, giving local merchants and the community tens of thousands of dollars worth of "coverage." At the corner of Main Street, next to the Village Park overlooking lovely Mirror Lake, is a landmark building known as 1 Main Street. 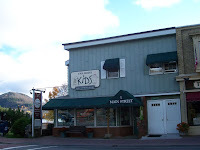 The founders of the children's store have owned the building for the last thirty years. It was originally the Lake Placid leather repair shop in the early days of the Village, circa 1935. It is an awesome location with Mirror Lake waterfront footage that has a boat rental business in the summer. There is a restaurant downstairs, a world-renowned children's store on the main, retail level and two apartments upstairs. Here's some additional information. This property represents a wonderful investment opportunity in Lake Placid, one of the top resorts in the United States. Just ask Diane Sawyer!